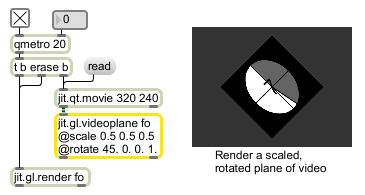 The jit.gl.videoplane object maps incoming video to a plane in 3D space. This may be used to exploit hardware accelerated rotation, scaling, interpolation, and blending. The jit.gl.videoplane object requires one argument: the name of a drawing context. A named drawing context is a named instance of a jit.window, jit.pwindow, or jit.matrix object that has an instance of the jit.gl.render object associated with it. This value may also be set via the OB3D drawto attribute. Sends the internal jit.gl.texture object the corresponding message. client_storage int Client storage flag (default = 1) When this flag is set, the jit.gl.videoplane object uses the incoming matrix's storage rather than allocating texture memory. This attribute is only valid on OS X.
colormode symbol Color mode (default = argb). Possible values are argb or uyvy. displaylist int Cache in displaylist flag (default = 0) This feature may be used to speed up rendering time by creating and storing a list of gl drawing commands on the graphics card. This will have no effect if matrixoutput turned on. nudge float Texture nudge value (default = 0.01) This value is the amount the texture is nudged from its boundaries to accomodate for boundary errors when mapping the texture to the plane. texturename symbol Sets the name of the internal texture.